Hank Hill might look askance at any artistic affectation of “propane and propane accessories” but give the big fella his due: propane is America’s grilling gas of choice. 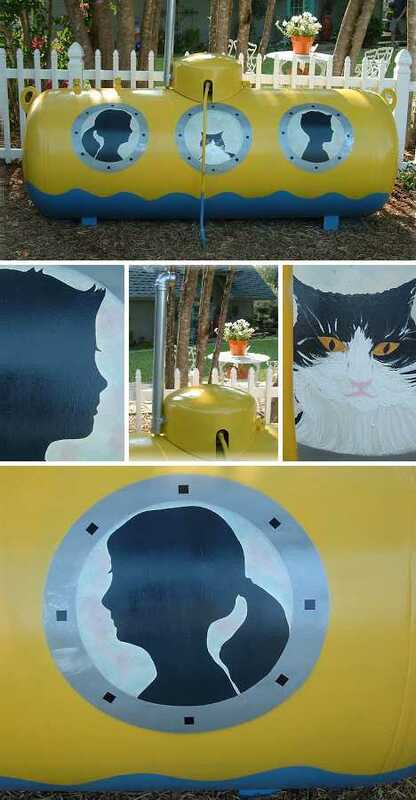 These days propane gas tanks have found a place in urban, suburban and rural settings with some owners choosing to beautify them so they’ll fit in even better. 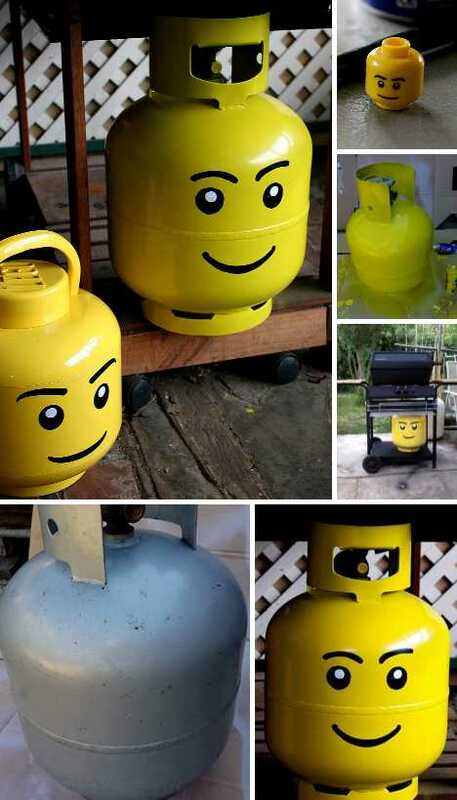 Ever notice how those dime a dozen 20lb portable propane tanks look sorta like LEGO heads? Will painting one yellow and adding minimalist facial features help? Yes and yes – and the gang at Instructables shows you exactly how to get ahead, so to speak, in the LEGO head lookalike propane tank game. Watermelons give you gas, who knew? 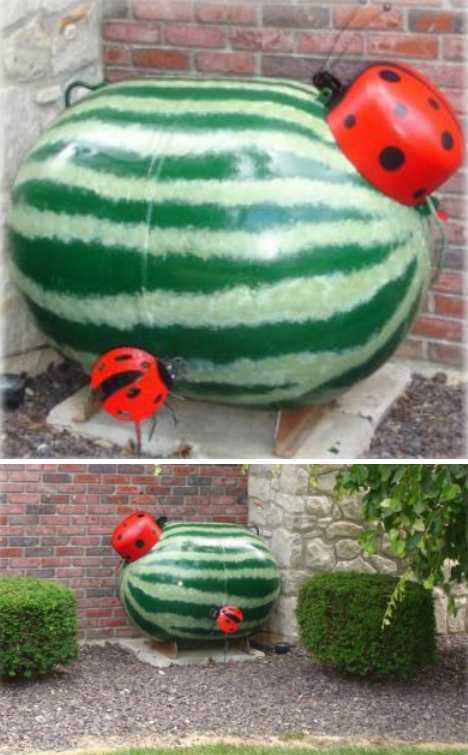 All it takes is a little imagination (plus a couple of old coat hangers and some wooden beads) and that rusty old propane tank will be looking as cool as a cucumber… or, well, some other large green edible. Is T.J. Darwin really “The Propane Picasso”? Undoubtedly the late Spanish artist would be impressed by the colorful and elaborate tableaux Darwin displays on water and propane tanks. The 46-year-old Darwin finds plenty of tanks to practice on in propane-dependent Idyllwild, CA, and a previous stint in the art department at FAO Schwartz allowed him to hone his illustrating skills. “I like the three-dimensional surface,” stated Darwin to a reporter from the local Press-Enterprise newspaper. “It tells a story.” Even more so once Darwin finishes with it. 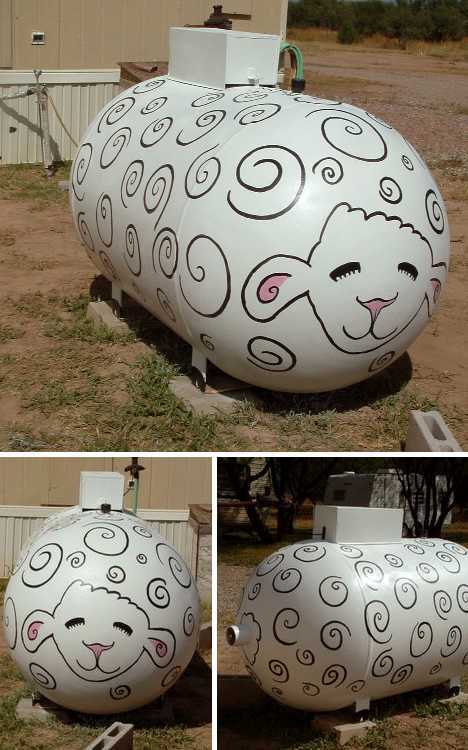 Who says painted propane tanks have to be wild & wooly when merely wooly is more than enough? Alexandra Orton whipped up “Fluffy” for the All the King’s Horses Children’s Ranch in Benson, AZ. 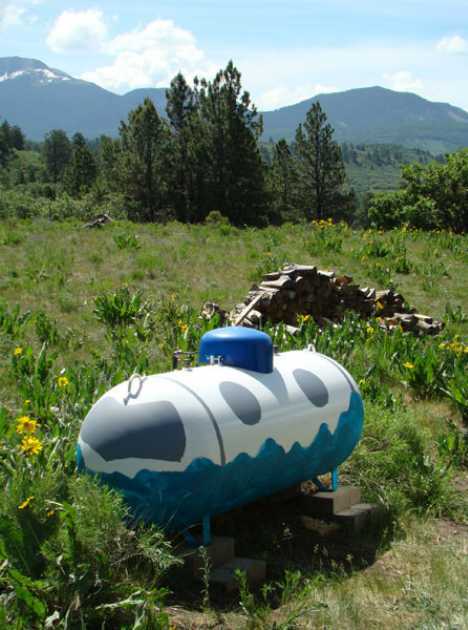 Artist Sally Cruikshank isn’t exactly a jet-setter but her hand-painted propane tank sure is and it’s anything but “plane”. Better keep that tank filled with propane and not Red Bull – all it needs is wings and it’s gone, man. 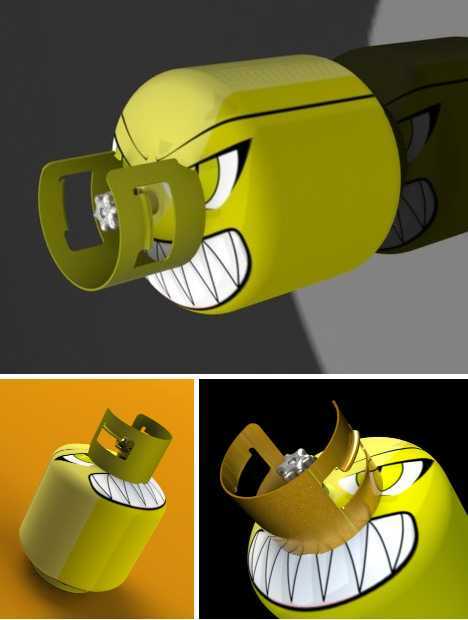 The talented folks at GrabCAD show that the art of propane tank decoration need not be a low-tech endeavor. According to Kastle at GrabCAD, the basic concept was downloaded from 3dcontentcentral and modified for use in a personal project. Sure hope this terrific tank sees the light of day someday! 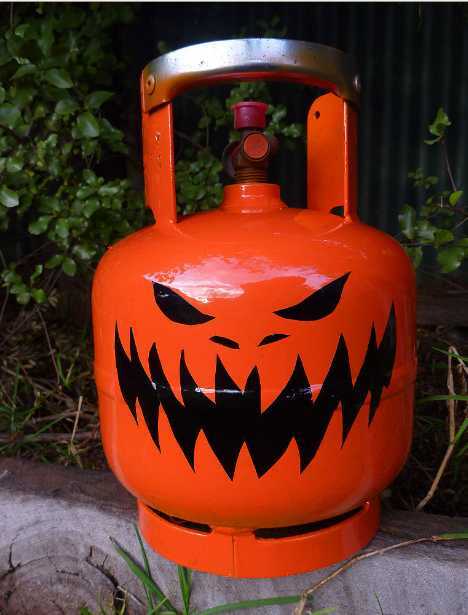 The creative crew from Instructables is at it again, this time transforming a clapped out but still serviceable propane tank into the hottest jack-o-lantern this side of Halloweentown. Word to the wise: this is one “pumpkin” you’ll NOT want to light up with a lit candle. You gotta support the team and where face-painting leaves off, propane tank painting picks up… or maybe that should be, kick’s off. Tailgating Ideas’ reader Mike from Severn, Maryland, shared his tank decorating technique and as you might guess, it takes both time and talent. Especially the former, as applying the pigskin-like dimples to the tank took hours using the blunt end of a toothpick. 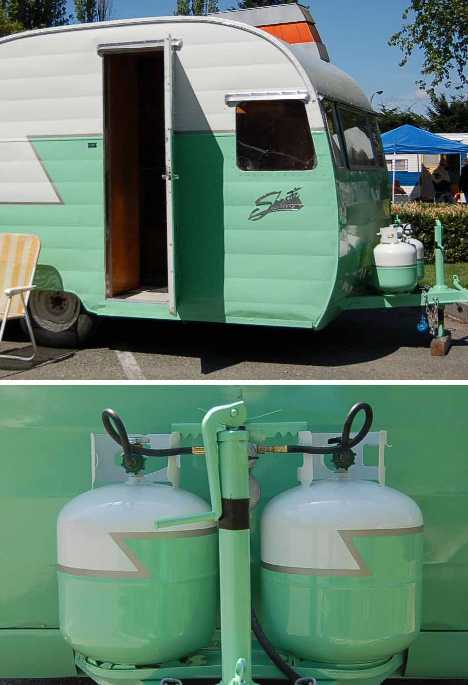 If you’re determined to restore a 1956 Shasta “canned ham” style trailer the right way, then leaving out the twin propane tanks is not an option. Don’t these look great all decked out in Mint Green & White divided by a staggered silver stripe? Don’t tell Mitt Romney but propane-powered submarines went out with horses and bayonets. There’s one cheerfully painted holdover, however, deep in the heart of Texas and as pretty as a yellow rose. A little Plaid acrylic paint topped with Valspar outdoor sealer ensures this sweet sub will sail on through any type of weather. 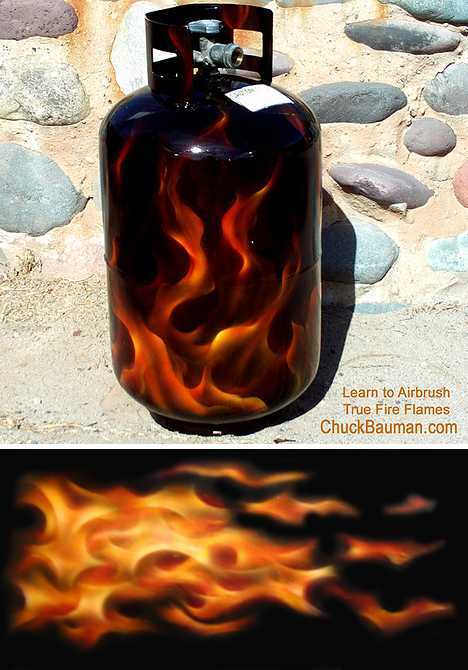 Chuck Bauman’s famed for his flames and deservedly so – the dude’s a master of the art of Realistic Flames Airbrushing! Some might say painting a propane tank with realistic flames is just asking for trouble but we disagree: it’s more like asking for admiring comments, and getting them. 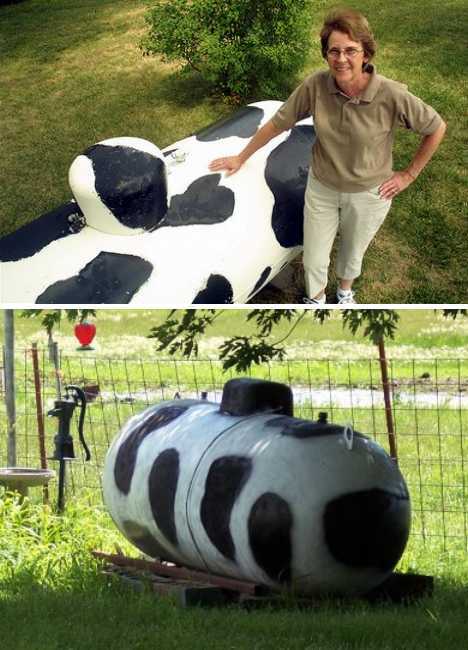 If your cow emits propane instead of methane, you just might be drawing a combustible concoction from a moo-tifully modified storage tank. If not, you’ve just plugged the grill fueling hose into a very unhappy bull. It’s a bird, it’s a tank, it’s a… tank painted up to look like a bird. 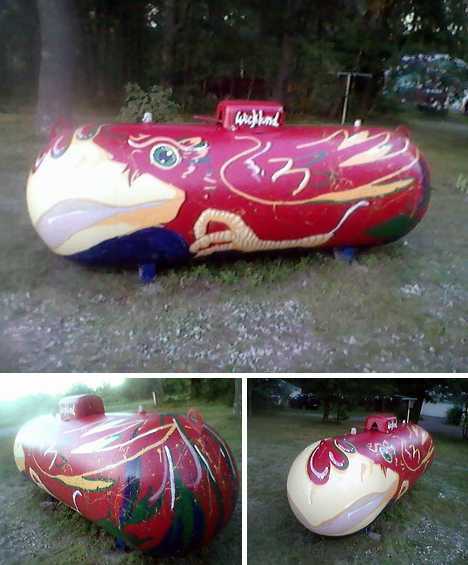 Won’t be the first time someone’s had to gas up the T-bird but anyway, this tank was originally supposed to be a rooster but the artist’s unchecked creativity soon led her off the beaten track into a very different place. Not that we’re complaining, the end result looks anything but cheep. 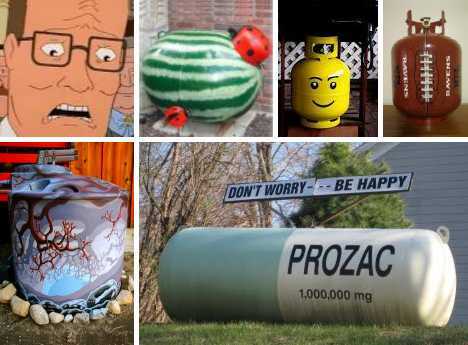 Lessee now, propane or Prozac? You’re gonna need a whole lot of the latter if you just filled your 500-gallon propane tank and the grill decides to self-destruct. 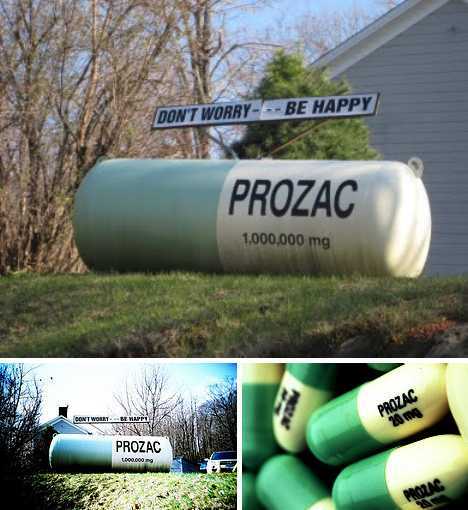 Luckily there’s a solution – sitting on somebody’s lawn in Milan (some say Red Hook), New York is the world’s biggest Prozac pill. You might think you’ll need a BIG glass of water to get that sucker down but good news everyone… it’s a suppository. You don’t have to love propane (and propane accessories) as much as Strickland Propane’s Hank Hill but a little TLC can go a long way towards beautifying your yard. 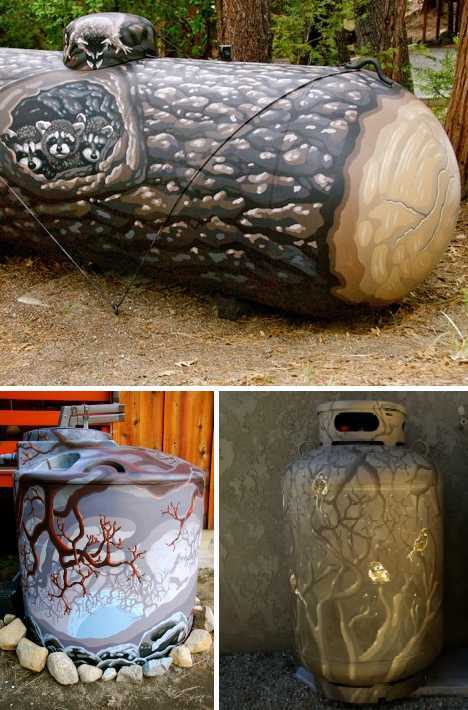 Propane tanks whether portable or permanent are easily visible so make sure they’re visually appealing – with a little imagination and some elbow grease who knows how your tank or tanks will end up?